Today's dinner, is a very flavorful, relatively quick and easy recipe. It combines turkey or chicken with a creamy coconut curry sauce and your choice of grain! Carbs of your liking (brown rice, Quinoa,....) We had wheat berries. Start preparing your carbs, as they can take a little longer than the rest of the dish. -Place a large skillet over medium-high heat and add a bit of olive oil. -Peel and chop the onion. -Add the onions to the skillet and gently brown them, add the black pepper to the onions. (The liquid of the onions brings out more of the pepper flavors). -Cut the chicken/turkey in small cubes ~1"
-Add the chicken and brown it until it is mostly done. -Now add the other spices. 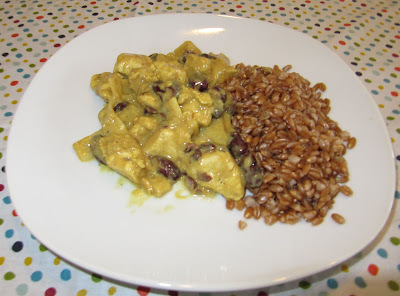 The curry powder should cover about 80% of the surface of the chicken and color it nicely. Take 1/4 of the coconut milk and keep it in a separate container (needs to be mixed with the corn starch later). -Turn down the heat and add the beans (drains the liquid in the bean can and add water and drain it as well) and coconut milk, let it boil at low heat for ~5 min. The chicken/turkey should be cooked all the way now. Have a taste and see if you need to add any additional spices. -Mix the starch with the coconut milk you put on the side until there are no junks left. -Add the starch/milk mix to the dish and bring to a quick boil. Then remove skillet from heat and allow to stand for 5 minutes.The sauce should thicken nicely. Ready is your quick and healthy dish!